Supplier & Trader of Window Film. Our product range also comprises of Window Blinds, Curtain Rods and PVC -VINYL Flooring. 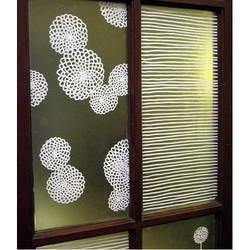 We are one of the foremost names for offering high quality range of Printed Window Film. The offered window film is specifically designed for windows of homes, offices and apartments. Our offered window film can be installed without damage to the glass surfaces of windows, in both the household and business applications. Offered window films are designed by making use of optimum quality raw material that is acquired from reliable dealers of the market.